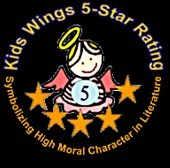 You can purchase the complete Kids' Wings 12-page Study Guide with activities for The Blue Ghost by Marion Dane Bauer NOW for immediate download for only $9.95! Family history ripples through your blood...your appearance, the problems they had, the adventures they experienced, and maybe even your name. You may even have a ghost or two in your closet! Liz did. Liz met the ghost while she was staying with her grandmother in the forest of Minnesota. But, why had the ghost come? What kind of ghost was it? A scary one? A dangerous one? How would you have reacted if you had been awakened in the middle of the night by a ghost calling your name...like Liz was? Would you be willing to help the ghost? Join Liz in a different kind of ghost story, one that ripples with family and its stories that are contained in the cabin where generations had grown up and at least one ghost, still lives. Children tell what they know about angels. Special Thanks to John Thorp for granting permission to use his original composition, "Softly" for the background music!